Made in the USA out of high quality materials, the Snake Bite is a dual-purpose tool that lets you open bottles as well as vent cans. Some of you may be asking; why ‘vent’ a can? I’ll let Snake Bite answer that one. Basic physics: If just the main can opening is utilized, the pouring has to stop so that air can enter the can and re-establish equilibrium. This is what causes the “glug-glug-glug” sound when pouring something from a can if it isn’t vented. If you have venting, then air is let in which constantly keeps equilibrium in letting the liquid out smoothly. This is especially important when pouring a canned craft beer into a glass. It’s worth mentioning that every canned beer has different levels of carbonation and due to that, pour results will vary. Venting also eliminates a significant amount of air you ingest while drinking straight from a can. This greatly improves drinkability, comfort, and overall experience. It works too. Upon receiving my Snake Bite, I purchased a few six packs to give it a go. 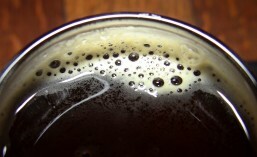 Granted, if you know how to pour properly, it is possible to get a smooth pour from a can without venting it. However, you must pour very slowly and carefully. Venting your can first eliminates this worry. You can pour as fast as you’d like, and you won’t get any ‘glug-glug’ whatsoever. 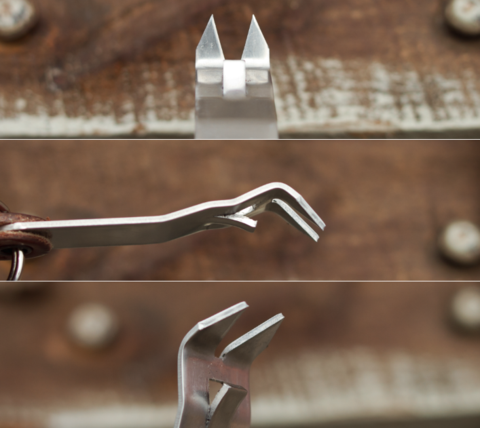 It’s also true that a traditional church key can open bottles and vent cans for you, but Snake Bite wanted to create an all-in-one tool that would accomplish both functions in a more compact design. Besides, most people I know don’t carry around a church key with them. It’s just not convenient. 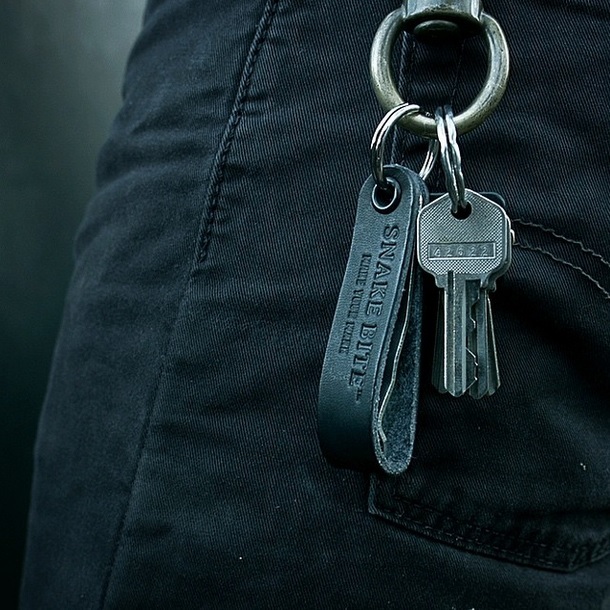 The compact design of the Snake Bite allows you to keep it in your pocket and/or on your key chain, so it’s always on hand when you need it. The leather cover for the Snake Bite fits snugly and is essential if you plan on carrying your Snake Bite opener in your pocket. The ‘fangs’ on the Snake Bite are actually quite sharp. Without the leather cover, I’m sure users would wind up stabbing themselves with the opener in their pocket. It’s that sharp which, of course, makes venting your can with it pretty easy. Heck, it could almost function as a personal defense device too. You could do some serious damage with the fangs on this thing. As a bottle opener, the Snake Bite does the job just fine – in fact much better than the cheesy little key chain opener I’ve had in my pocket for years. However, I wouldn’t recommend it for anyone who likes to collect bottle caps, since the Snake Bite will bend the cap (and can even leave little ‘fang marks’ on it). It’s a very practical on-the-go tool to have with you, but personally I’ll be using a different opener on any bottle where I want to save the cap. The cost of the Snake Bite is $22 and you have your choice of leather cover: black, brown or natural. 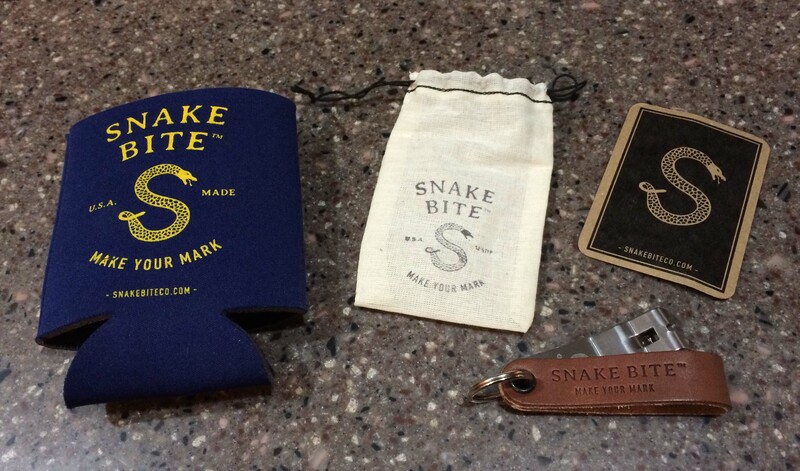 Alternatively, you can opt for the Snake Bite Kit, which includes a Snake Bite opener, a Snake Bite T-Shirt, a can/bottle koozie and 2 buttons/pins. Some may consider the Snake Bite a bit pricey for a bottle opener/can venter, but it is well made and should last you quite a while. You’ll have to decide for yourself if it’s worth the cost to you. Just be careful with those sharp fangs. This entry was posted in Beer, Cans, Opener, Product Review, Retail Product and tagged 2015, beer, February, Product Review. Bookmark the permalink.